It's week four at CASE Study with the lovely Laura Bassen as our muse. 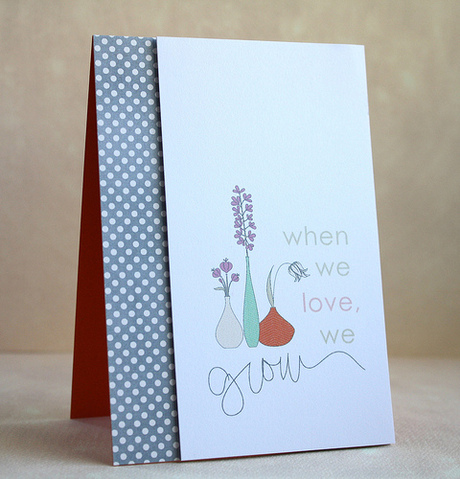 Here's Laura's beautiful card this week! A CAS beauty! I used the Spellbinders Nested Egg Dies to cut out the eggs and stamped using the Nestie Eggs Stamp set from Waltzingmouse Stamps (inks used Memento Angel Pink and Summer Sky). 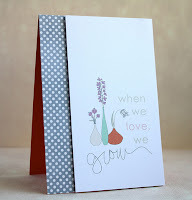 To add some texture to the white space I embossed the background with the Swiss Dots embossing folder. 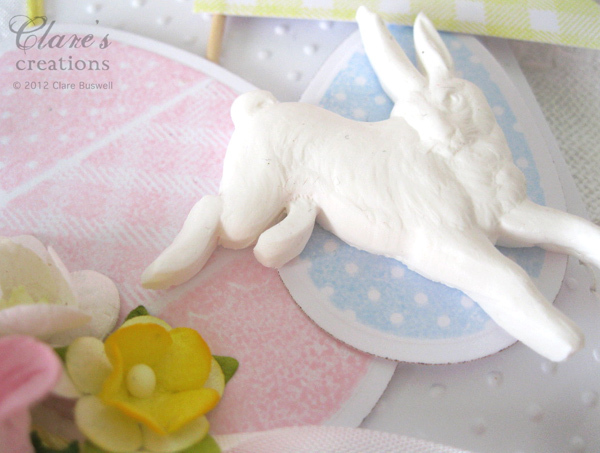 The bunny/hare I made from Fimo, I'm hoping to add a couple of these to my Etsy shop over the next few days. I made the little flag by stamping the gingham background in lemon using the Gingham & Co stamp set from Waltzingmouse Stamps. I love a little gingham at Easter! 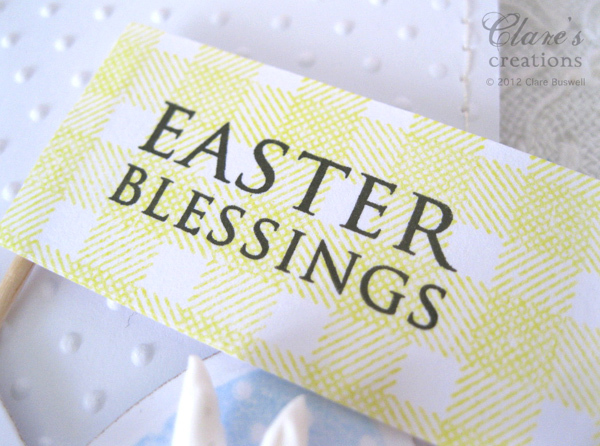 The sentiment is from the Nestie Eggs stamp set. I just added the flag to a wooden toothpick. 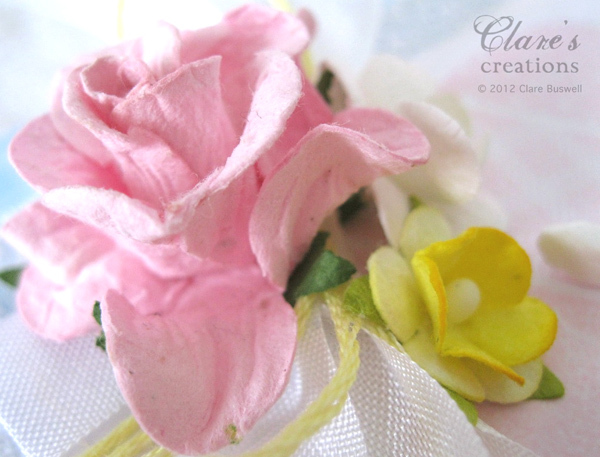 The pretty flowers and eyelet lace are from Wild Orchid Crafts. 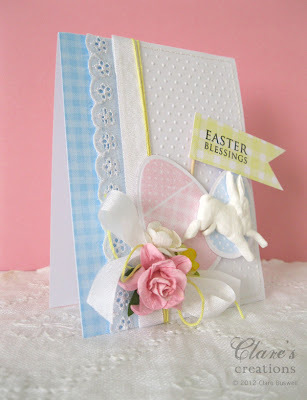 The blue gingham patterned paper is from Sweet Nectar by K&Co. It's a so lovely card!!!! And colours are sweet! I'm love it! So beautiful Clare ... and I love the bunny! This is just so beautiful! 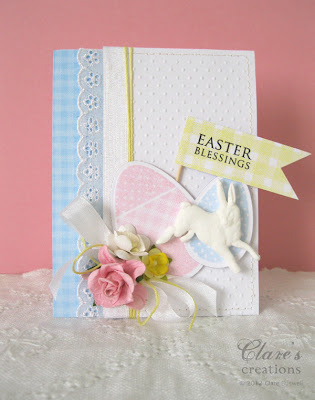 Love the dotty texture, the soft pastel colours, sweet bunny and fab ribbon! Love it! Clare, This is so pretty - love the soft pastel colors and that bunny - THAT YOU MADE!!!!! - WOW!!! GORGEOUS!!!! Your sentiment on a pennant makes it even better - so festive and beautiful!! Beautiful! I just love the eggs and the bunny! Great card Clare...love all the elements you've added...bunnykins looks super! This is so beautiful! Love that bunny! Love your take on this challenge. Great layout and love the soft colors. Awww! Love the bunny! Very sweet card! Awesome....that bunny you made is just too cute!!! I don't mean to drive you crazy with comments tonight, but i am loving all of your cards! The sweet textures and colors of this one really caught my eye! thanks for the inspiration, again!